The Eden Roadmaster is the leading scooter in its class. The Roadmaster features an extremely luxurious design with sleek lines and modern styling. The Eden Roadmaster features a high ground clearance, coupled with full car styled suspension to ensure a high degree of comfort and safety. The Eden Roadmaster has an extremely luxurious design that features sleek lines, modern styling and a beautifuly finished, shiny paintwork. You’ll also find that the Eden Roadmaster is the perfect size, with it being a very compact, road scooter; it’s not too big and it’s not too small! The 5-position adjustable delta tiller gives you complete control, meaning you can obtain the perfect riding position. On the tiller you will find various buttons and switches that allow you to change from drive to reverse, adjust the speed settings and sound the horn. The Eden Roadmaster features luxury, two-toned captains seat that is extremely comfortable and has adjustable head and armrests. The seat itself can be swivelled around 360° which enables you to get on and off the scooter with ease. You'll also find a small storage pocket at the back of the chair so that you can carry your belongings. The front and rear suspension of the Eden Roadmaster Elite, along with its soft, air-filled pneumatic tyres will ensure that you have a smooth ride - even when travelling over uneven, bumpy surfaces! The high ground clearance will also make sure that you can get up and down kerbs easily. Storing your belongings has never been easier. 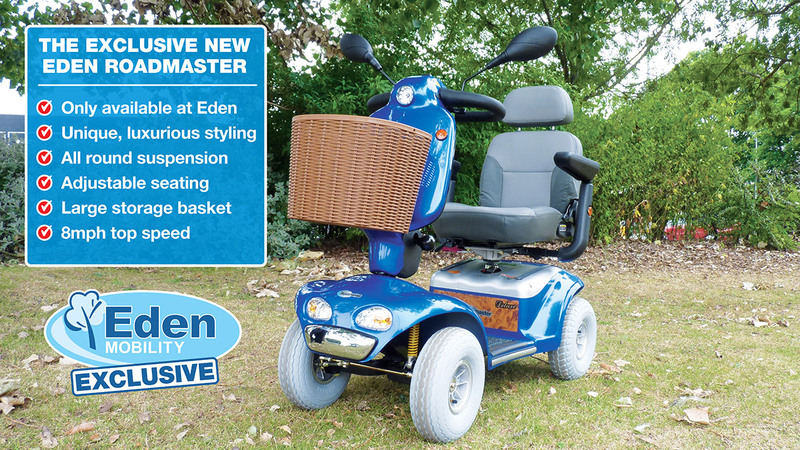 The Eden Roadmaster features a spacious front basket that enables you to do your shopping with ease. This basket is one of the largest in its class! The Eden Roadmaster has a range of safety features to ensure rider and pedestrian safety. These include front and rear lights, indicators, hazard warning lights, a reverse siren, side mirrors and anti-tip wheels. It also features front and rear bumpers to protect the mobility scooters components in the event of an accident. *Range can be affected by variable conditions such as user weight, battery and terrain.